Japanese Episode AG 157: "Usohachi and the Ninja School!!" American Episode 427: "From Cradle to Save"
As our heroes are on the road to the Battle Tube, Satoshi decides to stop for some training. He pits his Pikachu against his Donphan to develop Pikachu's Volt Tackle ability, and as the battle continues, a stray Rollout attack from Donphan destroys a nearby boulder! Behind the boulder was a young ninja named Koroku, who later reveals that he's a student of a nearby Pokemon Ninja School. Satoshi and his friends become interested, so Koroku invites them to try the school out for a day. They are taught by a kuno'ichi named Ichiko who has her students practice a number of concealment techniques. Later, the young ninja-in-training are given the task of using their ninpou to track down a Kakuleon. 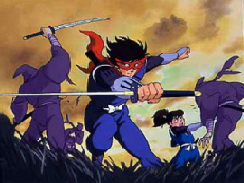 As our heroes search the woods, a young Usohachi approaches Takeshi and a group of fellow students. The students hear the pokemon's cry and remember how they heard that sound when their Oren berries were stolen the night before, so they accuse the pokemon of being a berry thief! Suddenly, the Rocket-Dan appear to kidnap everyone's pokemon. As the Rocket trio try their version of ninpou, our heroes use their pokemon to encase them in a giant ball of web. Before Musashi-tachi are sent blasting off, they reveal that they were the ones who had stolen the berries the night before. Now that Usohachi's name has been cleared, the young pokemon thanks Takeshi and then challenges him to a battle! The Pokemon Breeder has his Foretos fight the baby pokemon until it's weak enough to be caught by one of his Monster Balls. Now that Takeshi has a new companion, our heroes leave the area as they eagerly await their next exciting adventure. Damn, that Usohachi is annoying. The little turd of a pokemon makes its TV series debut in this episode, and Takeshi's capture of it means it'll be around for a few more episodes. 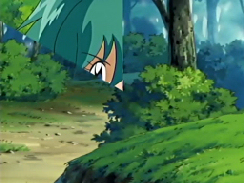 Luckily, this is Takeshi who's caught it, so we'll only have to put up with it for a few episodes before it fades into obscurity with the rest of his pokemon. 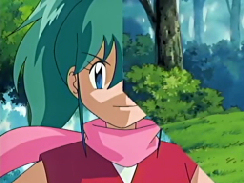 Speaking of forgotten pokemon; wasn't it nice to see Foretos again? I think this may have been the character's one and only battle in the entire Battle Frontier arc, but I really don't remember. 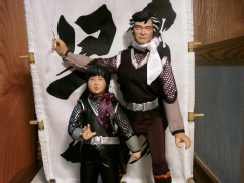 This site also has a lot of pictures from the Aka-Kage live action series. 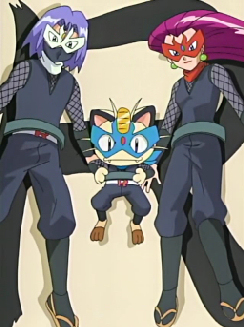 With Naruto being a mainstream hit these days, it's no wonder PUSA decided to keep a lot of the ninja references intact. 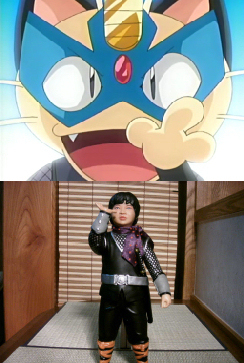 PUSA managed to translate some words (such as ninpou, 忍法, being translated as "ninja arts") while ignoring others altogether (such as kuno'ichi, くノ一, or Koroku's unnecessarily formal -degozaru), but I'm sure it's better than the rewrites 4Kids would have made to make the episode take place in California or something. The dub keeps a pathetic three pieces of Japanese music. Three. Also, have you guys noticed how those "silent moments" everyone was so happy about in "Fear Factor Phony" haven't been heard since that episode? Thumbs down, PUSA. Thumbs. Down. Foretos and Poppo keep their Japanese voices. A one-second transition shot from the shot of Ichiko after the underwater training to the shot of the forest before those Poppo show up is removed from the dub, most likely because of the way the commercial break is placed. When Takeshi is battling Usohachi with his Foretos, Advanced Adventure, the first AG opening theme, can be heard in the background. PUSA replaces this with their standard synthesizer stuff. The TO BE CONTINUED... screen is three seconds longer in the dub than it was in the Japanese version.